SharePoint Case Studies and Resources | Charter Communications | Colligo Networks inc.
Charter Communications is a telecommunications company that provides cable television, high-speed Internet, and telephone services to over 27.6 million customers across America. Charter is a Fortune 500 company and the fourth-largest cable operator in the United States, behind Comcast, Time Warner Cable, and Cox Communications and is the tenth largest phone provider in the nation. Simplified information management with a high rate of user acceptance. Charter employees stored information in disparate locations that included network file shares, Microsoft Exchange PST files, local hard disk drives, departmental document management systems, as well as Microsoft SharePoint sites. Charter provides thorough training to its employees to ensure that messages and documents are stored according to corporate policies, but with so many disparate systems in use, the compliance process was complicated. “None of our document management systems automated our retention activities,” explains Dan Vasey, Director of Records and Information Management at Charter Communications. For instance, to designate an email message as an official record, a user had to save the email in the MSG file format to a file share. “It was incumbent upon each user to later identify documents that had met their retention criteria and were eligible for destruction.” The save-as-MSG process also altered each message’s descriptive metadata, such as time and date stamp or sender name. “The loss of metadata made it challenging for employees to search for and quickly find what they were looking for later,” says Vasey. Charter wanted to simplify compliance processes and make it easier for users to work with and share documents outside of the corporate network, but, like many companies, it also wanted to reduce the impact of introducing a new technology or business process to its employees. Charter wanted to minimize the learning curve, to ensure 100 percent user acceptance. That required implementing the capabilities they needed within the same, familiar environment to which their users were accustomed. 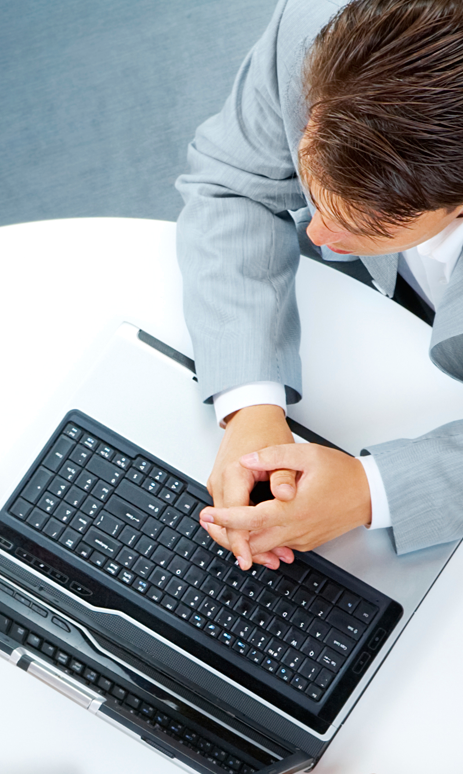 Charter evaluated a range of enterprise content management systems. It also considered applying an external layer of records and information management capabilities to the document management systems in use. “But the amount of development and work required was cost prohibitive,” says Vasey. “We wanted to take advantage of our existing investment in SharePoint system and we determined that it was a viable solution to meet our enterprise content management needs,” says Vasey. Charter was attracted by SharePoint’s in-place records management features and flexible retention schedules. 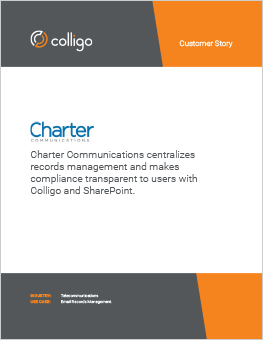 Charter also evaluated software from Colligo because it allowed users to move email messages and documents into SharePoint sites seamlessly. “We felt that the familiar, easy-to-use tools that SharePoint and Colligo provided would be readily accepted by users,” says Vasey. Charter conducted a proof-of-concept implementation using SharePoint and Colligo. Approximately 30 Charter users experimented with the solution, using it to designate email messages as official records and store them in SharePoint, and to manage documents in SharePoint document libraries from Outlook or their desktop folders. “We had very positive feedback,” says Vasey. In the new environment, Charter employees use Colligo drag-and-drop functionality to move email messages or attachments (such as Microsoft Word documents, Microsoft Excel spreadsheets, or PDFs) into a SharePoint repository, directly from Outlook. Using the Colligo software, employees also migrate files from network file shares to SharePoint. Users feel as though they are simply moving files among folders in Windows Explorer, though they are actually moving files from network file shares to SharePoint sites. The Colligo Windows app exposes SharePoint in a desktop window. From a user perspective, this requires little training or adjustment. As a user moves an item to a SharePoint site, the Colligo software automatically extracts descriptive metadata and transfers it along with the item. The software also enables users to easily add additional metadata to the file or email message. Charter takes advantage of SharePoint content types and managed metadata to automatically apply the proper retention policies to an item. For instance, if a user applies the content type “contract” to a document, the document is classified and stored as an official record, with retention policies that determine how long the document will be held. “SharePoint content types and the Colligo metadata capabilities make records management compliance transparent to users,” says Vasey. SharePoint managed metadata capabilities also help users find information. For instance, Charter can centrally define taxonomies in SharePoint for its enterprise content, and easily manage and apply tags to documents, to ensure consistent use of terminology and better search results. Charter employees can then search from within Outlook because Colligo integrates with SharePoint Search, enabling users to quickly locate email messages, documents and information. The Colligo solution supports local caching, which means that users can easily work with SharePoint-based documents and information, regardless of their network connectivity. “Our users really value this feature, especially for those documents that don’t require a version-controlled environment,” says Vasey. With offline access to SharePoint sites, employees can open a document from within Outlook, edit the document, and synchronize it back to the SharePoint site once reconnected. Colligo caching capabilities also enable remote users to manage email messages form smartphones and other mobile devices.